This Compendium is a comprehensive reference manual containing an extensive selection of instruments developed to measure signs and symptoms commonly encountered in neurological conditions, both progressive and non-progressive. It provides a repository of established instruments, as well as newly-developed scales, and covers all aspects of the functional consequences of acquired brain impairment. In particular, the text provides a detailed review of approximately 150 specialist instruments for the assessment of people with neurological conditions such as dementia, multiple sclerosis, stroke and traumatic brain injury. Part A presents scales examining body functions, including consciousness and orientation; general and specific cognitive functions; regulation of behaviour, thought, and emotion; and motor-sensory functions. Part B reviews scales of daily living activities and community participation. Part C focuses on contextual factors, specifically environmental issues, and Part D contains multidimensional and quality of life instruments. Each instrument is described in a stand-alone report using a uniform format. A brief history of the instrument's development is provided, along with a description of item content and administration/scoring procedures. Psychometric properties are reviewed and a critical commentary is provided. Key references are cited and in most cases the actual scale is included, giving the reader easy access to the instrument. The structure of the book directly maps onto the taxonomy of the influential International Classification of Functioning, Disability and Health (World Health Organization, 2001), enabling linkage of clinical concepts across health conditions. The Compendium will be a valuable reference for clinicians, researchers, educators, and graduate students, and a practical resource for those involved in the assessment of people with brain impairment. The book is accompanied by a password protected website. 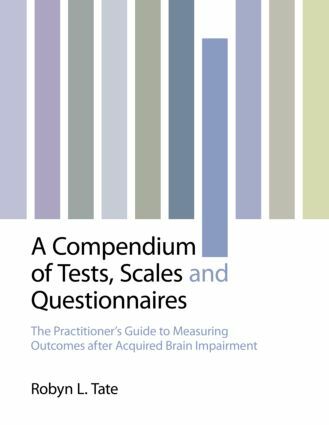 For a one-off payment, purchasers of the book can gain online access to the majority of the tests, scales and questionnaires featured in the book as downloadable PDFs. See inside the book for more details. Dr Robyn Tate is a clinical psychologist and neuropsychologist with more than 30 years of clinical and research experience. Her primary field of expertise is the rehabilitation of traumatic brain injury. She is currently Professor in the Rehabilitation Studies Unit, Sydney Medical School, University of Sydney, Australia where, in addition to her own clinical and research work, she is involved in the teaching and research supervision of post-graduate medical and psychology students. She is also the founding co-editor of Brain Impairment, the official journal of the Australian Society for the Study of Brain Impairment.